Royally Wed was yet another adorable and charming novel in this series! The books in this series always make me feel warm and fuzzy inside. I am a SUCKER for any book involving a romance with a royal, so this series is perfect for me! This book was one of those books that I read when I was in the book for a cute and fast read, and it really hit that spot! In most books involving a royal romance, the male is royalty, which I adore. However, this story had the women being royalty, which was a nice change! I enjoyed the romance just as much when the woman was royal! I was worried about the woman being royalty because I felt like I wouldn't be able to relate to her. I was so glad that the author managed to make Amelia so relatable to the average woman. Amelia was easy to feel for because she was giving up so much for her family. I was constantly wishing for the best for her. Amelia was a wonderful character that I really connected to. The other main character, Asher, was a dreamboat! He struggled a little bit with performance anxiety and confidence in himself, which was easy to relate to. I loved watching him learn to believe in himself and get back to loving the things he used to enjoy. The romance in this book was a sweet fairytale. The connection between Amelia and Asher was instant and palpable. I would have liked the connection to have been drawn out a little more, but I still really adored their relationship anyway.There were a lot of obstacles they had to overcome, but they knew their love was worth it. I really liked them together and I was rooting for them to get their well deserved happily ever after. Overall, this was a fun and charming romance novel! 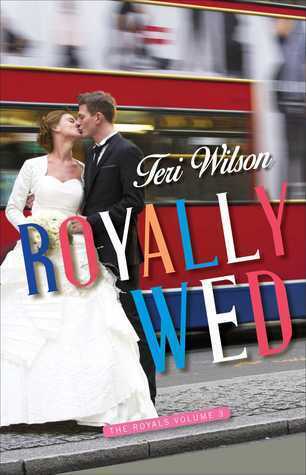 If you love romances involving royals, then I definitely recommend checking out this book and series! Teri Wilson’s novel Unleashing Mr. Darcy is now a Hallmark Channel Original Movie, and she currently has two other films in development with Hallmark. She’s also at HelloGiggles.com, a lifestyle and entertainment website founded by Zooey Deschanel. Teri loves books, travel, animals and dancing every day. Visit her at TeriWilson.net or on Twitter @TeriWilsonAuthr. Enter to win the complete Royals Serie by commenting on this post! The giveaway will be one galley each for Volumes 1-3:Royally Roma, Royally Romanov, Royally Wed. U.S. only please.